Harrisburg, PA – Governor Tom Wolf and Senator Bob Casey joined federal, state, and local leaders in celebration of the recent arrival of the first two super post-Panamax cranes at The Port of Philadelphia (PhilaPort), celebrating another major milestone spurred by the governor’s port development plan. 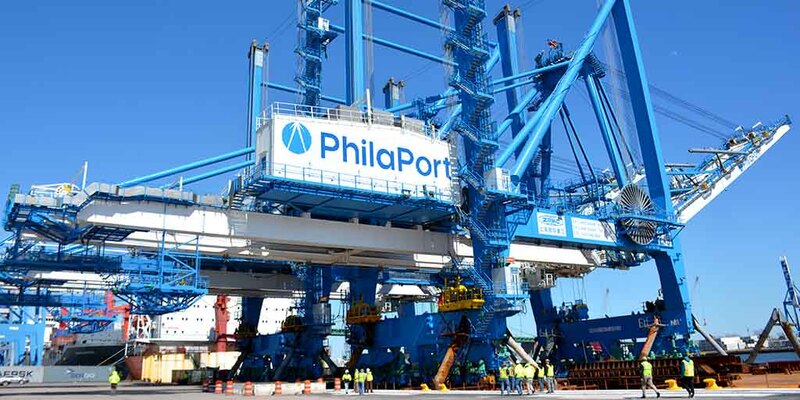 The arrival of the cranes marks another significant milestone since the governor announced his plan to invest more than $300 million in PhilaPort’s infrastructure, warehousing, and equipment in 2016. Since implementing the infrastructure improvement plan the port realized record breaking cargo volumes and nearly 20 percent container growth in 2017, and just last month welcomed the arrival of the largest container vessel to ever call at the Port. Development is slated to continue through 2020 and is projected to support thousands of jobs and generate an increase of more than $100 million in state and local tax revenues annually.